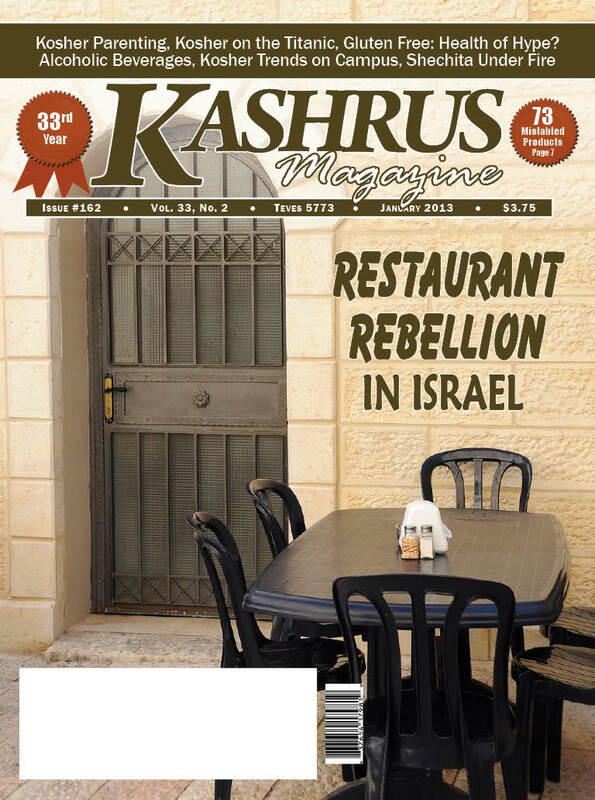 In May of 2012, (#159, “Keeping Kosher on Campus, the Highs and the Lows”, p. 62) we printed an article about keeping kosher on the campus, a major challenge for many young people. We highlighted new kosher programs and pointed out the pitfalls of being at a college where you have to trek to a dining room passing non-kosher facilities where you may be tempted to “find something that’s okay.” Who’s Entitled To Kosher? The recent flap at Harvard, where the university’s dining services department, HUDS, posted a sign at the Hillel limiting those who were entitled to participate at the Hillel meals to people who either were “a member or an invited guest” brought an avalanche of negativity. Many non-Jews felt offended at being barred from the kosher meals. It also brought a response from those who view Hillel and Harvard as inclusive, not exclusive. An interesting story or a statement of where we are today? Be that as it may, we decided to look a bit deeper to see what trends are visible on the campus regarding kosher. And we found five. The Bottom Line The recession has hit everyone, even universities with major endowments. That being so, some universities have sought to save money on their kosher programs. At one leading university, they dismissed the kashrus agency, which had certified their kashrus for years, and replaced it with another agency which charges less, but rarely visits the campus at all. The new agency uses students as the mashgichim and they receive minimal training. Things came to a head when a doctor who visited the university and seeing that the dining room claimed to be “glatt kosher”, sat down to eat. Then he discovered a dairy condiment in the fleishig dining area. He no longer will eat there, but the current “little-show” kashrus agency still has the account. A kosher observant student need not study the financial stability of the university he attends, but he surely should check out who does the kosher certification. Is it a non-Orthodox Hillel rabbi or an Orthodox one? Is it a reputable kashrus agency? Are there mashgichim? These are not optional questions; these are the questions one has to ask. Mini-Offerings For The Kosher Student It would be nice to enter a stately dining room dedicated to kosher students the way kosher restaurants do in the city, but not all kosher programs are full service. In fact, they often only offer dinner. In some universities, the kosher availability is just a deli stand. Man (or woman) can not live on hot dogs alone! While it sounds a tasty place to hang out, such fare alone is unlikely to fill a student’s needs. Kosher Dropouts In our May article we talked about many of the challenges to keeping kosher on campus, but there is one problem that needs to be stated very clearly. For an observant Jew there can be no compromise, kosher is kosher, and, to readers of KASHRUS that means kosher-certified. But, there are other Jews and unfortunately they are the majority on campus. Someone who is “partially kosher”, will see nothing wrong with going to the regular university dining room and ordering what he feels is “safe” (e.g. vegetarian). The fact is that the majority of Jews who “seek kosher” on campus fit into this last grouping. That is very significant. The most important factor to the university and even to a Hillel is the question of how many people will frequent a kosher dining hall. If there are not enough people, they will lose too much money; if it is too many, as with Harvard, they might also lose too much money. Those who dabble with kosher but will eat in the regular dining halls skew the numbers. The real problem of university living is that the Jews who compromise influence a good many serious Jews to compromise “just a little.” The Ubiquitous Chabad House Let’s face it, Chabad shluchim (as per their website) are servicing 165 plus campuses, a massive effort. But that is not just for a shiur or a fahbreng. Many Chabads offer food; some do just Shabbos meals, while others are involved in a daily meal plan. This development is very significant as Chabad standards should offer pas yisroel and cholov yisroel as well as high end glatt kosher. How they do it financially, physically and politically, is beyond the scope of this brief article, but they do it in campus after campus. More power to them. Simi Speaks “We have a diagnosis,” my mother’s voice came somberly through the line. I clutched the public phone in the high school dormitory where I stayed, and looked around to make sure no one was in earshot. On the one hand, I felt a tremendous surge of relief. After months of futile testing and false diagnoses, it sounded like I would finally hear the reason behind the crippling stomachaches I had been experiencing for so long. Their intensity incapacitated me for days at a time. Once there was a diagnosis, there would be a course of treatment, a glimmer of hope that maybe I would be cured. On the other hand, the tone of my mother’s voice boded no good. “What is it?” I asked, dreading the answer. “Celiac disease. It’s a lifelong condition.” That mournful tone caused a deep wave of panic to rise up in my throat. I couldn’t think. I couldn’t talk. What exactly was this ominous sounding disease and would my life ever be the same? After the shocked silence, I said the first thing that came to mind. “Is it my heart? Am I going to die?” At this, my mother must have realized how morbid she sounded and began laughing. “I didn’t mean to scare you there. I don’t know much about celiac, but what I do know is both good and bad. The bad part is that you are stuck with this for the rest of your life; and the good news is that, with a special diet, you will be totally fine and not suffer from those stomach aches anymore.” That sounded a lot better than some mysterious disease, which in retrospect sounded similar enough in my head to “cardiac” that I first thought there was something dreadfully wrong with my heart. “What’s the special diet?” “Well, this may be part of the bad news…” And thus began the saga that my family likes to call, “gluten-free living.” Celiac disease is a condition that damages the villi in the lining of the small intestine and prevents the absorption of nutrients of food that are important for staying healthy. The damage is a reaction to eating gluten, the protein found in wheat, spelt, barley, rye, and possibly oats. In truth, it was a tremendous relief for me to know that all I had to do was stay off any gluten for the rest of my life, even the most microscopic amount, in order to cure those dreaded stomach attacks. Due to the genetic nature of celiac disease, the entire family had to go for testing after a biopsy confirmed my initial diagnosis. The rest of my family, aside for one brother, a pizza-loving, challah-devouring bachur, came out squeaky clean. The difference between us is that he never suffered from those debilitating symptoms that I did, so he doesn’t see any silver lining in living with such a restricted diet for the rest of his life. As soon as we confirmed the diagnosis, my mother sprang into research action, canvassing the library, the internet and other informational resources for books, articles and just about anything she could get her hands on discussing celiac disease or gluten-free foods. My baby brother learned how to say “gluten free” before he said “Mommy”. While the family had a hard time adjusting to the constant admonitions of, “Don’t contaminate the cream cheese!” and the strange new pastas my mother tried out on all of us, eventually they got used to the concept of gluten free living, or at least as much as it affected them. Eating outside the home was a greater challenge, though, as I would find myself in social settings, semachos and the like. I found myself constantly approaching kitchen staff and managers, probing, challenging, not settling for the platitudes and reassurances they tried selling me just to get me off their backs. I had never been assertive and I couldn’t believe that person was me. The person who would walk up to the hostess of a party, ask her to see the packaging of the chips, or hot dogs, or whatever it was I was craving to eat, and then walking outside to make the phone call to the manufacturer. It was a difficult adjustment, but eventually, the words began coming out of my mouth automatically: “Hi, I just wanted to know if your (fill in the blank) is gluten free.” In fact, I once had to call a certain restaurant to ask them if their salad was considered fleishig, and, without thinking, I asked instead if it was gluten free. While it is definitely not easy sitting at a simchah feeling hungry and bored while everyone around you is eating their elegant meals, still, I am grateful it’s celiac and nothing worse. To see the rest of this article, click "Buy this issue now" or "Subscribe" at the bottom of this page. This is true story. It is my own life story, but you will hardly believe it. I wouldn’t have believed it either, if it had not happened to me. There is a story told of someone who saw a non-Jew selling tefilin. He realized that this pair must have been stolen. A clever Jew was he. He unwound the tefilin and placed the hand tefilin on his left hand and then held up the head tefilin with a puzzled expression and asked the man, “Where is the tefilin for the right hand?” The man realized that this pair was “incomplete” and so he sold the pair for $10. My story is somewhat different, but it is about why I wear tefilin on both my right and left hands. It all began near my thirteenth birthday when my father, aware that my dominant hand was my left one, took me to the rav to discuss my tefilin, which I would soon be wearing. The rav and my father conversed about the correct hand on which I should wear the hand tefilin and they both agreed that, despite my obvious proficiency with my left hand, based upon sources in kabalah, I should wear tefilin on my left hand the way righties do. I was never one to argue, not with my father and not with a rav, and so it was that I began as a man wearing tefilin on my left hand. Around my eighteenth birthday, there was a need for me to check my tefilin. I took them to a respected Flatbush sofer and he found them unfit (posul). In my hand tefilin, the word “Vedibarta” was repeated at the end of one line and at the beginning of the next one. The parchment of tefilin cannot be corrected under such circumstances and so it meant another pair for me. But, I continued to put them on my left hand, the way a righty would do. Somewhere in my early twenties — I was then in beis medrash — I approached my rosh yeshiva and asked him on which hand should I put the tefilin. I do not remember the exact conversation that we had but, maybe it was because I professed that I did certain activities with my right hand (which are few and not all that significant). The rosh hayeshiva told me to continue to put the on my left hand. Then when I was twenty eight—yes, a full fifteen years after my bar mitzvah—I was learning through the halacha and was dumbfounded. It was clear from Shulchan Aruch that the halacha in my case is that I am a full-fledged lefty and should be wearing my tefilin on the right hand, not the left. I raced over to the rosh yeshiva, the same man who had told me some years back to put the tefilin on the left hand, but this time he sent me to a specific responsa of Rav Moshe Feinstein, zt”l which clearly discussed my exact case. Today, I put tefilin on both my left and my right hands. First I put one on my right hand, as a lefty should do, and then remove it and put another one on my left hand. Now, you will ask me, after the fifteen year odyssey, why would I continue to put tefilin on my left hand. I know now that I am a lefty and that halacha requires me to put tefilin on my right hand, so why do I keep using the left hand also? The answers are somewhat personal, but there are two, and since you’ve been nice enough to read my story, I will share them with you. First, although halacha dictates that lefties should put tefilin on their right hand, yet, there is still the dictate of kabala to deal with. Also, and this is just for me personally, I feel that after so many years with tefilin that were not kosher and having put them on the wrong hand, I desire so much to perform this mitzva totally. Maybe I am just trying to make up for lost time. I want to thank KASHRUS for letting me have this opportunity to tell my story. If it prevents even one Jew from making the mistake that I did, it will be worth it. I made one error in judgment and it has taken over ten years to correct, and even then only because of the goodness of some Jewish children. But, I am getting ahead of my story. I have a large family. My wife and I are very close. I want nothing more than to take care of the family, but sometimes that is hard, very hard. I have been a mashgiach in a restaurant and have held other jobs in the Jewish community, but I never seemed to make enough to take care of my family. Maybe I talked too much; certainly I complained to too many people. Maybe I had borrowed too many times. I am not sure how it actually happened, but someone heard about me and came to make me an offer. He opened his jacket and pulled out one hundred $500 bills. Yes, that is $50,000. He offered it to me. “It’s all yours,” he said, “but, on one condition.” I had to take a package — yes, I knew what was in it — to another country, actually my home country, as it were. One package, one time, that was all, and the money would be mine. I knew that it was wrong to do, but I began to think. I need to put food on my table. My family is suffering. This money will take care of them for a good long time. I could do it just this once. Sometimes, you know that something is wrong, but, you still think that maybe Hashem put this opportunity in front of you. Maybe this is how He is going to provide for your family. You see a spot next to a hydrant. “Just for a minute,” you say to yourself. But, you did it. You broke the law; now you may have to suffer the consequences. There are many other temptations in life. There is no need for me to list them for you. Anyway, this was my temptation. But, I thought, I could do it just this once. They caught me and I’ve had to spend ten years in jail, just about half of my sentence. Every two years I petitioned anew to be transferred to my home country, to serve the remaining years where I would be near my family; but, so far, each appeal had been refused. And, my recent appeal had been sent out nearly a year ago, yet no answer had come. And, then, a L’Asurim volunteer came to visit me in prison. As he was about to leave, I told him of my appeal. He volunteered to ask the boys in his class, in the Brooklyn yeshiva where he teaches, to daven for me. Within two days I got the letter. I am going home! I was ecstatic, but I still had to know for sure. So I contacted the rebbi and I asked him, “Did your class daven for me the next day after you visited, as you had offered?” “Yes,” he told me, “and the following days also.” So, I am going home. But that is not the best part. My country of origin will let me off with the time that I have served in the U.S. And, it is all because a class of yeshiva boys davened for me, and because their rebbi cared. In somewhat of a departure from the normal programming on our weekly show on Radio Hidabroot, “KASHRUS On The Air”, on May 21, Dr. Meir Wikler joined Rabbi Yosef Wikler. Dr. Wikler, a popular psychotherapist and marriage counselor, is the author of eight books. The topic was “Kashrus In The Family” — when kosher presents a challenge to family members. We discussed the topic and answered listeners who called in. You can hear the tape by going to the archives on radiohidabroot.com or on Jrouteradio.com. Our show is Kashrus On The Air, which is broadcast Monday evenings from 6-7 PM. One area which we discussed that evening was how a father or mother could set limits for their child, limits affecting kashrus, without the matter escalating into an area of contention. Perhaps they wish to tell him not to eat at such and such a pizza store, or not to go to the birthday party at so and so’s house, or to go but not to eat there. Also, there may be a family simcha where the parent wants to limit what the family will eat. How should the parent go about setting those limits without making it a cause for disagreement between parent and child? Dr. Wikler stressed that a parent has both the right and the responsibility to set standards for his/her children. “A family is not a democracy,” he pointed out. Parents have the life experience and the maturity, as well as the moral and the halachic responsibility, to guide their children by establishing limits in all areas of life. That being said, Dr. Wikler gave listeners several points all parents should consider when they are called upon to set these limits for their child. 1. Parents should accept responsibility. They sent their child to a particular yeshiva or beis yaakov, which has a certain built-in code of conduct. That code covers such things as dress, how the child spends his spare time and, yes, kashrus as well. If it is acceptable in Yeshiva X for most boys to wear certain clothes, you cannot demand that the child be so different from his friends. You chose the school; therefore, you must accept some responsibility for what the present situation is and you cannot expect a child to behave significantly different from his peers. You can try to influence him to follow your choices, but the bottom line is that he must be allowed to “be normal” to his friends in yeshiva. 2. The parent must show empathy for the child’s feelings. Yes, you want to set limits and you are asking for change, but the child’s feelings need to be validated by the parent showing that he understands the challenge which the child feels. Sometimes just stating his position and showing that you note it is enough for him to accept what you are asking him to do. 3. Present the matter in a positive rather than in a negative way. “I know that you can do this and I know that you will feel good that you have been able to keep your friends and still maintain our family’s standards.” You show that you are not challenging your child but you are trying to help him make good choices. 4. If you have to take away something, then give something else at the same time. If the child is being asked not to go to a party or not to eat something, such as the dessert, offer to give the child a similar nosh, which is comparable in his eyes, and do it quickly, so that he sees you really do love him. It also helps him to see that following you is not going to lead to “losing out”. I pointed out to the listeners another thing which can help in setting rules. Do not be the one who is always demanding from the child. You can involve another person, for example, a rabbi or a rebbi or someone in the greater family who can be a third party to help in the matter. This way the child can express himself and might find it easier to hear from a third party why this matter is so important to the parent and why it may not really be that hard to do. As parents, we all experience challenges to our authority, but utilizing our authority properly to help our children is what parenting is all about.